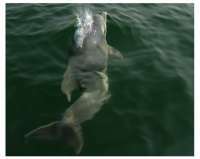 In August, 2003 a young bottlenose dolphin was filmed in the Shannon estuary. Nothing remarkable about that but this one was different. This dolphin had a deep crease in its right flank, behind the dorsal fin, and an upward curvature of the spine bending to the right at the tailstock. When it swam, it tended to the left, and when it surfaced to breathe, its tail cleared the water before rolling to the left before submerging. It was seen on a number of occasions during August trying to bow-ride the dolphinwatch boat from Carrigaholt, Co Clare. This deformity is called kyphoscoliosis and has been observed in a number of bottlenose dolphins, including recently in the Moray Firth, Scotland, however its cause is not known. It is most likely a genital defect but stress, bacterial infection and even high levels of organochlorines have been suggested as potential causes in other species. Local dolphin boat operator, Geoff Magee, says he first saw this dolphin in the Shannon estuary in August 2002. If this is the case then this dolphin is one year old. Bottlenose dolphins tend to be weaned after around 18 months so at present this dolphin is still dependant on its mother to sustain it. Although some dolphins with scolisosis have been known to survive into adulthood, it seems unlikely this dolphin will be able to catch fish and other prey items for itself, which suggests its chances of survival are poor. Will we see this dolphin next year ? Will it be able to fend for itself ? Only continued monitoring of the Shannon dolphins will answer this question and help us discover more interesting aspects of their ecology and behaviour. Reference for scoliosis in cetaceans: Bergham, J & Visser, I.N. 2000. Aquatic Mammals 26(1), 17-25.